Barbara Firth, who has died aged 84, was an illustrator of children's books of great sensitivity, insight, humour and imagination. 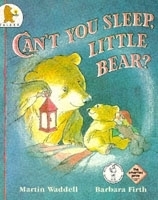 Her best-known works were probably the five Little Bear books, written by Martin Waddell, of which the first, Can't You Sleep, Little Bear?, won the Smarties Book Prize and the Kate Greenaway Medal in 1988, and is as perfect a picture-book as anyone could hope to make. Barbara was modest to a fault, a lover of animals and nature generally, a woman of strong will, however gently she might apply it. She told the truth in a distinctive warm and quiet way; she did not write her own stories, but a perfect sense of story informed every line of her drawing. Late in her career she said there was a story she had always wanted to write, but could never find the words; it concerned a chicken who longed to smile but was unable to, having no lips; who wanted to show her teeth when she smiled, but had none; who wondered about the qualities of lipstick and dentures. 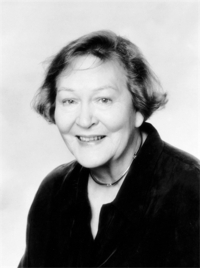 Her own favourite of her books was The Park in the Dark, also written by Martin Waddell, which won the Kurt Maschler award in 1989. 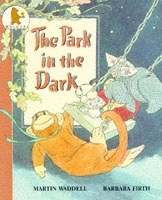 It told a late-night adventure story about three characters - Me and Loopy and Little Gee, whom Barbara imagined to be a monkey, a knitted elephant, and a very small black and white pet of uncertain breed, in a pinafore - all soft toy animals she had found and bought at a local jumble sale. It was understood between the author and illustrator, that while the author might give the characters their names, their exact physical nature was a matter for the illustrator to decide. Barbara and Martin made a perfect, very popular and entertaining story-telling team. Barbara was born in Cheshire and was always proud of her family background - she came of strong Yorkshire stock, farmers and blacksmiths until the depression, when her father took a job on the railways. She drew plants and animals from the earliest age, partly inspired by her father's love of horses, and encouraged by her teachers. But art and illustration played little part in her early career, which progressed through pattern cutting, design and show cards for Marks and Spencer, to knitting and crochet instruction diagrams for Vogue, for whom she worked for 15 years. And then, in the 1970s, she met Amelia Edwards, the great art director of illustrated books, at Marshall Cavendish, and step by step they moved from the part-work Golden Hands towards Sebastian Walker, Walker Books and the glorious picture-book years of the 1980s. I was lucky enough to work with Amelia and Barbara on many books, by many authors, over many years; but first of all, Barbara illustrated a series of six animal stories, which I wrote in 1983-4, called Great Escapes. For Barbara these books were particularly significant, because in them she moved from the exact and careful practice of non-fiction illustration, to something more personal and original, the heartfelt portrayal of character and the visual exposition of story. In these arts she proved exceptionally gifted. Speaking of this change, she said later, in an interview with Stephanie Nettall, with wonder, "My style started to get more lively: now I can be too exuberant, but once I'd found it was acceptable to draw in that way, there was no holding me. It worked, didn't it?" For me the pleasure was extraordinarily great - as Barbara brought to vibrant and visible life the old man, Angel, and his performing dog, Jack; Lady Loudly, the goose, who kept saying to herself, "I'm very important. It's time I told the world! "; Waldo, the tortoise, who was accidentally fired from a cannon; and so many others. Though she was a very private person, Barbara knew much about people, animals and the world. And she shared her knowledge with deep feeling and sensibility. Generations of children have loved, and will always love, her books; and her long collaboration with Martin Waddell brought a joyful richness - at once emotional and comical - to storytimes across the world. Barbara lived in Harrow, London, for the greater part of her adult life, with her sister Betty. who survives her, with a large family of animals always at hand - including the original Waldo, the tortoise, now more than 100 years old.